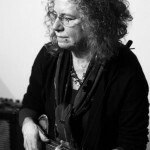 Barb has been kicking around the community radio scene since the mid-1980's - first in Connecticut on WPKN and then at WMPG after settling in the state of Maine in 1989. She is also an active musician who plays in a wide variety of contexts on a variety of instruments, especially 4-stringed fretted ones. Barb spent many years as a theater/non-profit administrator who also got involved in theatrical sound design along the way. The sound design continues, the administration work has been retired.